What can one eight-year-old with FASD do to make a difference in FASD Awareness. Go to the bottom of this page and find out! Welcome to the 2019 Red Shoes Rock International Virtual Race. This year our little guy Mac has stepped out in the form of a FLAT MAC BODY DOUBLE. Mac dreamed of traveling the world to TELL EVERYBODY – EVERYPLACE – EVERYDAY about FASD and tell ONLY TELL THE TRUTH because that is good enough. 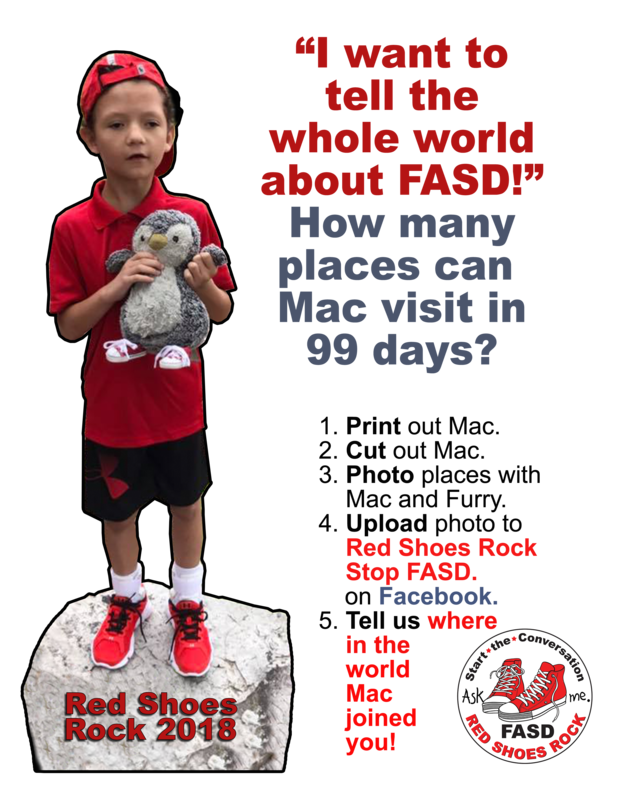 With your help, Mac, hopes to travel the world in 99 days to give a bigger voice to persons with FASD (Fetal Alcohol Spectrum Disorders). Wear your red shoes and take pictures of where in the world you are with Mac’s Body Double. In the heart spirit of the FLAT STANLEY, project created by Dale Hubert, M.Ed. of Ontario, Canada, Mac hopes to send his body doubles to tell the story of FASD. If Each One Can Reach One person that will be good and if you reach more – well, that is super-duper good. The original FLAT STANLEY BOOK by Jeff Brown is available at Harper Collins. INTRODUCE MAC TO YOUR COMMUNITY – AND TAKE PICTURES WITH MAC, YOUR FRIENDS, YOUR COMMUNITY AND YOUR RED SHOES. HAVE FUN STARTING CONVERSATIONS ABOUT FASD. Just so you know – Mac likes all kinds of places – restaurants, playgrounds, fire and police stations, stores, riding bike, parks. He hopes to see the ocean, and mountains, and deserts and jungles. He especially like city signs with the names on them. Mac says “Keep on sending me around the world” I want 100 countries and languages in 2019!